A Diagnostic Marker for Veterinary Inflammation: Feline, Canine, and Equine Serum Amyloid A - Advanced ImmunoChemical Inc.Advanced ImmunoChemical Inc.
Advanced ImmunoChemical now offers 8 monoclonal antibodies (MAbs) for the detection of canine and equine serum amyloid A (SAA), with 6 of the antibodies also detecting feline SAA. For calibration, we offer native purified recombinant equine, canine, and feline SAA proteins. The MAbs are sufficient for measurement in plasma with all recognizing equine and canine SAA, and 6 recognizing feline SAA in both ELISA and Western blotting. Click here to review Feline, Canine and Equine Serum Amyloid A (SAA) product performance data. Click below: Animal Serum Amyloid A and SAA-related product details. Serum amyloid A is an acute phase protein that is a diagnostic marker for several types of inflammation in dogs, cats, and horses. Previous studies using hSAA-TIA for SAA detection and concentration measurement have shown that, along with measurements of white blood cell count, the measurement of SAA concentration in felines provides a useful, non-invasive diagnostic test for inflammation (1). 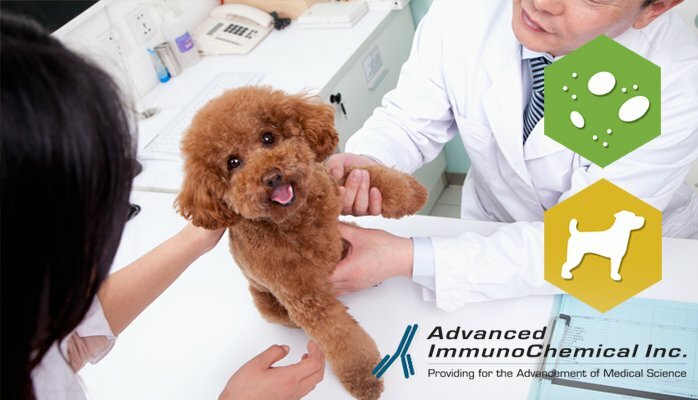 The same has been supported through the measurement of canine SAA, which is increased in sites of systemic inflammation related to gastrointestinal, neoplastic, and neurological disorders, validating its medical relevance in the clinical field (2). Studies of equine SAA levels have discovered that SAA concentration measurement in blood is advantageous for monitoring of post-operative surgical wounds that may become inflamed (3). Equine arthritis and tenovaginitis, common joint diseases in horses, are also linked to SAA levels in synovial fluid (4). In comparison to C-reactive protein, another acute phase protein secreted in response to inflammation, SAA is shown to perform significantly better as a diagnostic test indicating sites of inflammation (5). (1) Tamamoto, T. et al. (2008). Verification of measurement of the feline serum amyloid A (SAA) concentration by human SAA turbidimetric immunoassay and its clinical application. J Vet Med Sci, 70(11), 1247-1252. (2) Christensen, M.B. et al. (2013). Canine serum amyloid A (SAA) measured by automated latex agglutination turbidimetry is useful for routine sensitive and specific detection of systemic inflammation in a general clinical setting. (4), 459-466. (3) Jacobsen, S. et al. (2005). Use of serum amyloid A and other acute phase reactants to monitor the inflammatory response after castration in horses: a field study. Equine Vet J, 37(6), 552-556. (4) Jacobsen, S. et al. (2006). Concentrations of serum amyloid A in serum and synovial fluid from healthy horse and horses with joint disease. Am J Vet Res, 67(10), 1738-1742. (5)Christensen, M.B. et al. (2014). Comparison of serum amyloid A and C-reactive protein as diagnostic markers of systemic inflammation in dogs. Can Vet J, 55(2), 161-168.